Sri Lanka’s tourist arrivals in the month of July rose 25.2 percent year-on-year (YoY) to 133,971, helped by increased tourist arrivals from China, Russia and the Middle Eastern region. Most of the tourist arrivals were from Western Europe with 278,667 tourists visiting in the first seven months of this year recording a 15.6 percent increase over corresponding 2013 figures. For the month of July 54,857 tourists arrived in the island, 10.3% more than July 2013. Arrivals from North America rose by 12.1 percent with 42,822 visitors for the first seven months in the year while arrivals from Eastern Europe increased 44.1 percent with the arrival of 92,903 tourists. Most of the arrivals from Eastern Europe were from Russia with 41,381 arrivals representing a 72.0 percent increase. Tourist arrivals from Middle East rose in July by 55 percent to 5,998 and for the year arrivals increased by 14.0 percent to 44,601. 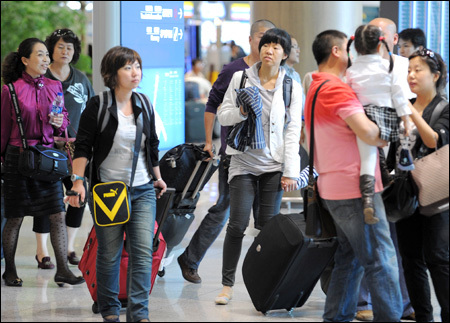 In the first seven months of the year 156,677 East Asians arrived in the island, an increase of 53.1 percent. Number of Chinese tourists arriving in the island rose by an impressive 144.2 percent to reach 67,408. Arrivals from South Asia, the other region from where most of the tourists come, increased by 19.5 percent in the year with 203,004 tourists flocking to the island while, arrivals from India increased 24.5 percent to 133,515 in the first seven months of 2014. In the first six months of the year, 33,920 Australians arrived in the country, an 11.2 percent increase from the previous year. Sri Lanka has earned US$ 901.8 million from tourism in the first five months of this year, an increase of 35.8 percent compared to last year. This entry was posted in Sri Lanka, Sri Lanka Tourism. Bookmark the permalink. CFH Team getting into Christmas Spirits…. Wonderful Time of the Year……The Love for Christmas and Passion at CFH reflected through beautiful decorations…..!